Every so often, a girl needs more than just a cocktail from an attentive bartender. Sometimes she needs a little intellectual stimulation and challenge. If your regular drinking buddies don’t suffice… it’s time to drag them along to Quiz Night. 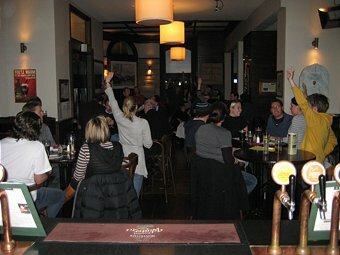 The first Quiz Night I ever stumbled upon was actually in O’Byron’s Irish Pub in Cincinnati, Ohio. I was there for work and a group of us stumbled in from the cold looking for a good meal and a laugh. Therein lie the essentials of any good pub quiz: good food, good whisky and a good time. Although they poured my extremely delicate Glendronach into a glassful of ice, they redeemed themselves with a hot pot pie to die for and a whole section of the quiz devoted to “Down Under”. Needless to say, the first quiz I ever did, we won with shining colours! Ever since I’ve been meaning to go to another one. To be fair, my housemate has been raving about Quiz night for years, about the same length of time that he’s been quizmaster at The Drake but two boys and two girls, none of us the competitive type, we booked a table (a handy piece of advice!) and turned up. The food was great, substantial and tasty apart from the Thai Green Curry that even the chef at the table couldn’t quite handle the heat of! They replaced it happily with a beetroot salad and off we went into Quiz happiness! Being a Monteiths bar, I can always find a tasty beer to satisfy and they have a decent selection of treats, including vegetarian options. Nice work. The Livewire Entertainment “Believe it Or Not? !” quiz is I think, one of the best in the country. They’ve made an art of great questions and a presentation style that works for dozens and dozens of pubs and bars. At first it might seem daunting but our quizmaster was readily at hand to explain how it all works. Then we were winning – just like that! For the first 6 rounds. Then it all took a frightful turn in the Kiwiana round. It was a lack of knowledge in regards to former Prime Ministers (we’re young, ok?) and Fred Dagg lyrics that let us down, but unfortunately once the cookie started to crumble, it crumbled all the way! Never fear.. the competitive nature within us has risen! We’re planning a return appearance for a shot at the bar tab prizes and this time we’re taking extra brainpower – an Irishman and my mother, who’s famous for delivering history and geography lessons on any long car trip. We’re bound to have it sussed! Just in time for winter I think, make sure to grab some friends and check it out, but I’m serious when I say, give them a call and book a table. Quiz night is going off! Tuesdays at The Drake, 2 Drake Street, Freemans Bay.